Posting to Twitter, host of radio show Science Friday Ira Flatow revealed his brother was "saved by his Apple Watch," alerting him to a higher than normal heart beat. According to the personality, the heart beat was in excess of 200 beats per minute, prompting the sibling to take a trip to the hospital. Doctors issued a diagnosis of tachycardia, a condition when the heart rate exceeds the normal resting rate, which for most adults would be a resting heart rate of over 100 beats per minute. While such rates could be normal, as in cases where the person regularly exercises, it can also be deemed abnormal for a variety of problems, including electrical issues within the heart itself. My brother was saved by his Apple Watch. After he felt a rapid heart beat >200 bpm, his watch told him to "go to the hospital." He did and his tachycardia was diagnosed. Flatow also posted a comment from the brother on the accuracy of the Apple Watch, noting "during the 15 hours I was at the hospital hooked up to the monitors, my monitors never disagreed with my Watch's reading. I checked many times." 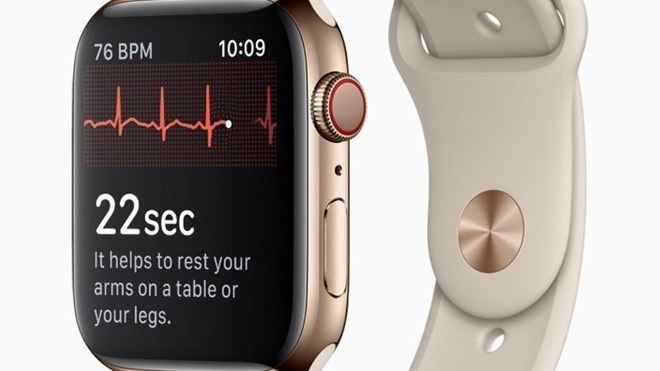 The introduction of functions in watchOS 5.1.2, including enabling the electrocardiogram function in the Apple Watch Series 4 in the United States and the Irregular Rhythm Notification for all models, has been credited with saving numerous lives since the start of the year. In January, a New Hampshire man credited the Apple Watch Series 4's ECG function for spotting atrial fibrillation. In February, a North Carolina native was diagnosed with supraventricular tachycardia following a similar Apple Watch notification, while another in Washington learned his atrial fibrillation had returned via the device. The heart rate function does not require the lead 1 ECG function- the older watches can detect the pule with the LED on the back of the watch. I am sure many more lifes saved by Apple watch but not reported as the case. This is just the beginning of a revolution in personal health monitoring. I think Samsung is introducing a blood pressure monitoring function. Glucose monitoring will be next. Think of an Apple watch with all those health monitoring functions built-in along with the software to analyze and report findings to your doctor in real time. Months back I mentioned how these cases will be so common they won't be news anymore. "during the 15 hours I was at the hospital hooked up to the monitors, my monitors never disagreed with my Watch's reading. I checked many times." It’s not a game. It’s not a function that work only on paper. It’s work for real . It report problems about the heart. It give advice to breath deeply when sensors and processor think is time to do it. Apple Watch is innovation . Pure innovation. Thanks Apple. You did say "most" adults. Can you provide proof? A normal adult resting heart rate can be anywhere between 60 - 100 beats per minute. Those of us that are more physically fit have a rate lower than 100. Mine typically hovers around 80-85. I am no doctor but I think the extreme fit have lower heart rates at rest than average (below 70bpm). Suffering from heart problems myself I have at a recorded instance where Apple Watch informed me of high heart rate while at rest, simply forgot to take my medication. I also found the Apple watch heart rate to read the exact same values as what was found in the hospital. The more fit you are the lower your heart rate. I don't remember the numbers but I believe extremely fit people could go under 60. It can, but when it does it’s nice to be able to check specifically for AFib with a single-lead ECG. I have a family member (who was using my Series 3 Watch) that kept being reported of an atypically high resting heart rate. He thought it was a Watch issue but he eventually got a checkup because it wouldn’t go away and because he had been feeling tired. AFib showed up and he had a valve repaired yesterday using the MAZE procedure. Yeah, but if he got the alert that might mean that he wasn't in sinus rhythm. There are different types of tachycardia. I used to have a version where my heart beat was super steady... just really really fast. My cousin has a form where his rhythm is both fast and out of whack. The former is more inconvenient, the latter has a higher risk for stroke. 60 isn't even "extremely" fit. It's moderately fit. Professional athletes can dip below 50. As a nurse, if I saw a true resting heart rate of 100 (say in a patient in bed & not aroused or disturbed), I wouldn't be alarmed, but I would look for a cause - particularly if it were a new phenomenon. Mine is usually between 48 and 52 -- but it only gets to 48 when I'm in race ready condition. Some endurance athletes go to the low 40's and I have heard claims of high 30's -- although I suspect they may be a one-off. That's right. But most fit people would be over 60. I go to the gym a few times a week, for an hour most days but for 2 on the weekend. Nobody would likely call me “very fit” or an endurance athlete but might think I look like I’m in shape for my age. I usually get numbers in the mid to upper 40s or low 50s while at rest and when I’m sleeping it isn’t particularly uncommon for my heart rate to drop below 30. I’m not doubting that athletes typically have lower heart rates, but physiology definitely plays a part as well. This is so stupid. Tachycardia is not fatal, certainly not at the levels that an Apple Watch would pick up first. I'm a paramedic and people feel their hearts racing and have discomfort etc. You can detect tachycardia with a simple pulse check. Also all the people with atrial fibrillation you hear the Apple Watch saved their lives. Almost everyone over 75 has A-Fib. Yes it can lead to bad things but it can be controlled. These are things a person's doctor detects. Apple Watch many things, but this frequent claim of Apple Watch saved another life is well overblown hype. Yes, just as some, like Greg Lelond (cyclist) have amazing VO2Max's (the ability to deliver & use Oxygen to the muscles), I suspect that some have naturally lower heart rates than others. But in your case my personal bet is that maybe you should give yourself more credit! Also, some medications (like Digoxin) can lower heart rate as well. Yes, that's true -- tachycardia by itself is seldom fatal unless it goes into a fibrillation, but that's rare. But it does have multiple causes -- most of which can be fatal. It's interesting the different perspective of nurses and paramedics. When I was training to be a nurse I (incorrectly) assumed that a paramedic was just a nurse with less training. Now I realize that we have very different (but equal) specialties and training. I now know that, in an emergency, give me a paramedic over a nurse everytime. Innovation? Not at all! My android-loving friends tell me that the curved glass on the side of their Samsung is pure genius innovation. A watch that can measure heart rate? Well, that's just a shrug off to them. It's amazing that Apple is still tagged with not being innovative when they make things like this, right?